Below are a few pictures from Grace. Best wishes from both of us, and we hope you will spend good time with family and friends. Looking forward to seeing many of you at Corvair Colleges, at Oshkosh and on the flight line in 2015.-ww. The old 1966 Corsa that has been with me for 18 years, shares the carport with our Airshow/College trailer. Photo taken from the front porch which has Christmas lights 365 days a year. I will be out of the shop Dec. 25-29 only, and then back at work to get ahead for the New Year. We have in process batches of motor mounts, intakes and valve covers for 2015 shipping, New Conversion Manuals and DVDs shipped this last week. 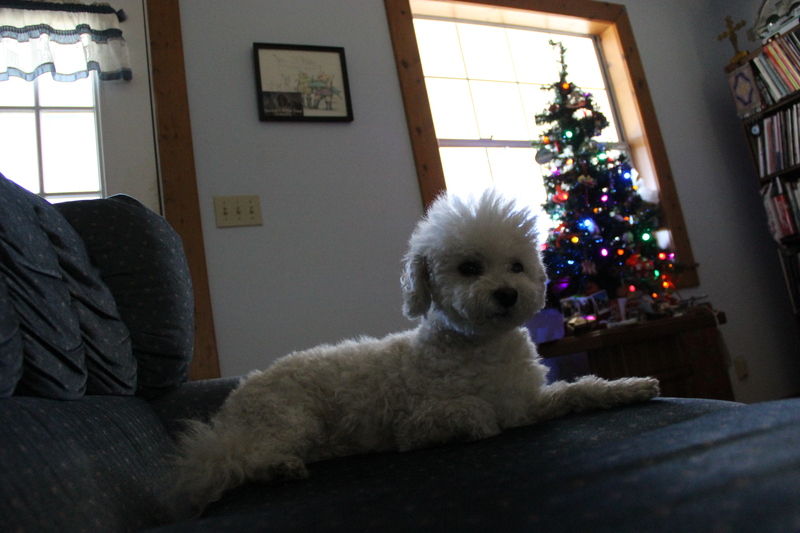 ScoobE on the couch by the tiny tree. Selfie in the front yard, three of us taking a lap around the airpark on the Grace’s XR-200R. 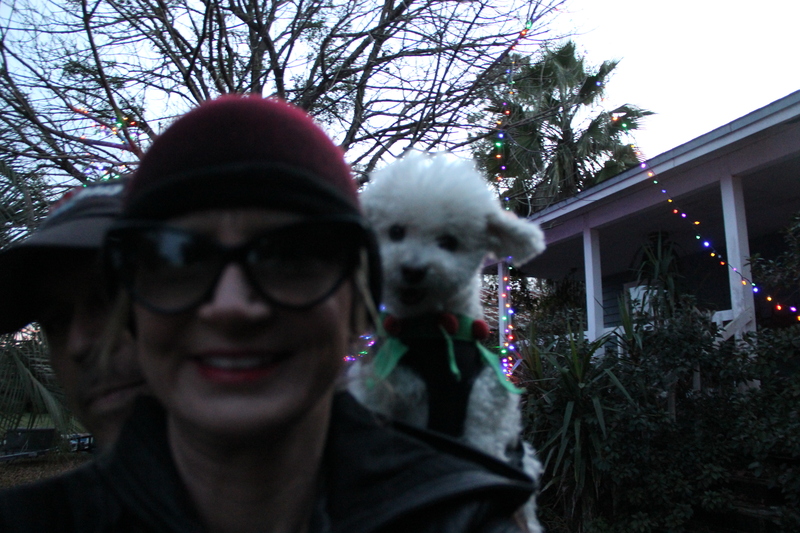 The dog can ride on her shoulder like a parrot, but he does with his harness on so he isn’t in danger of bailing out. ScoobE on the hood of our neighbors restored duce and a half. 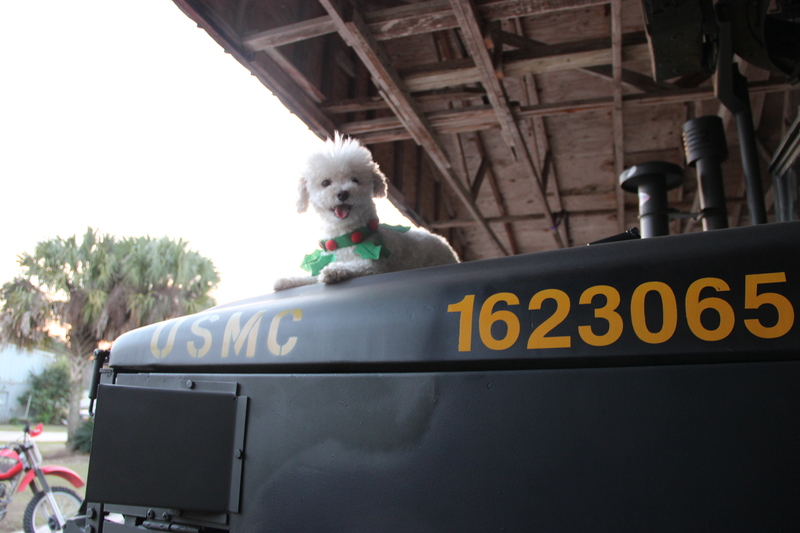 Other than a windsurfer and a steam train, ScoobE has come along on every from of transportation from a Beach cruiser to a Boeing 767. He doesn’t care what it is, as long as he gets to go. A red, white, blue and evergreen Christmas. Grace’s 1946 Taylorcraft in the yard in front of the hangar at night. Best wishes for you, your family and friends in the days ahead. A great time to reflect on all the blessings the year has brought, and to look ahead for new seasons, adventures and friends, in the Arena. A Merry Christmas, Hanukkah, Kwanza, Festivus, Winter Solstice, (If I’ve missed one, include yourself) and goodwill towards men and women for the holidays as well as the new year, especially you, William and Grace. Thanks for educating and amusing us, not only on Corvair engines, but on a whole range of topics. May everyone have a happy and prosperous year ahead. 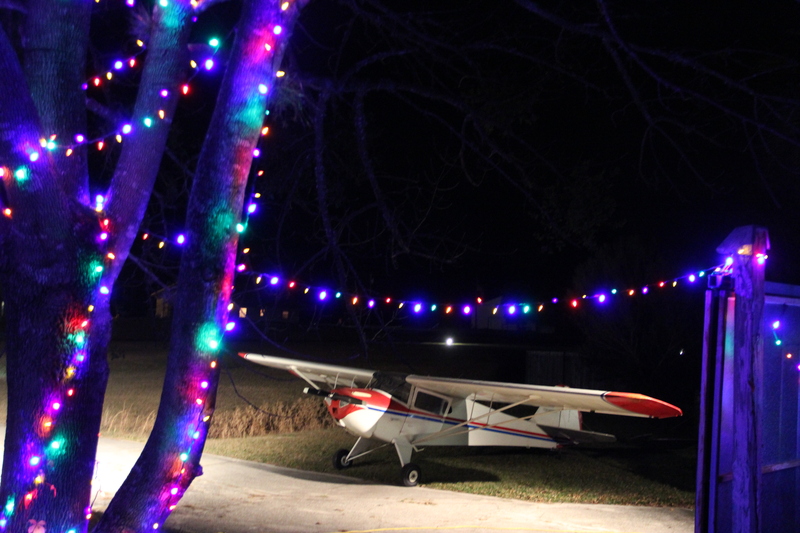 I love picture of the Taylorcraft through the Christmas lights. Great picture! A Very Merry Christmas and a Happy New Year! And a very successful and prosperous 2015! Merry Christmas to You, Grace, ScoobE and your families, and a happy new year! Wishing William, Grace and Scoob E a Merry Christmas Joyous New Year and Blue Skies! 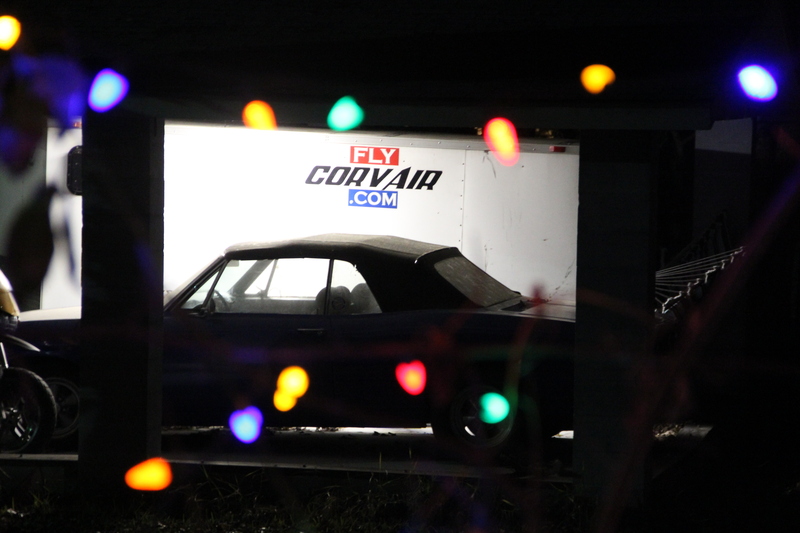 Merry Christmas and Happy Holidays to everyone in the Corvair movement! Merry Christmas and a happy and prosporus New Year William, Grace, Sscoob E and everyone else in the Corvair Movement! Looks like your Christmas was a merry one for all. I especially enjoyed the pic of the T-Craft framed by lights. Have a very happy New Year! Looking forward to seeing everyone at the next Corvair College.